Since the adoption of the Directive 2006/87/EC in December 2006, amendments to the Rhine Vessel Inspection Regulation have been agreed pursuant to Article 22 of the Revised Convention for Rhine Navigation. It is therefore necessary to amend Directive 2006/87/EC accordingly. It should be ensured that the Community inland navigation certificate and the vessel certificate delivered in accordance with the Rhine Vessel Inspection Regulation are issued on the basis of technical requirements which guarantee an equivalent level of safety. In order to avoid distortions of competition as well as different levels of safety, the amendments to Directive 2006/87/EC should enter into force as quickly as possible. Following the adoption of Commission Implementing Decisions 2012/64/EU (2), 2012/65/EU (3) and 2012/66/EU (4) of 2 February 2012 on the approval of three classification societies in accordance with Article 10 of Directive 2006/87/EC the necessary amendments to Annex VII to Directive 2006/87/EC should be made. Annex II to Directive 2006/87/EC is amended in accordance with Annex I to this Directive. Annex VII to Directive 2006/87/EC is amended in accordance with Annex II to this Directive. Annex IX to Directive 2006/87/EC is amended in accordance with Annex III to this Directive. Member States which have inland waterways as referred to in Article 1(1) of Directive 2006/87/EC shall bring into force the laws, regulations and administrative provisions necessary to comply with this Directive at the latest on 1 December 2013. They shall forthwith inform the Commission thereof. This Directive is addressed to the Member States which have inland waterways as referred to in Article 1(1) of Directive 2006/87/EC. Done at Brussels, 10 December 2012. (1) OJ L 389, 30.12.2006, p. 1. (2) OJ L 33, 4.2.2012, p. 6. (3) OJ L 33, 4.2.2012, p. 7. (4) OJ L 33, 4.2.2012, p. 8. (5) OJ L 373, 31.12.1991, p. 29. (107) “competent person”: a person who has acquired sufficient knowledge in the relevant area on the basis of his or her professional training and experience and is sufficiently conversant with the relevant rules and regulations and the generally accepted technical rules (e.g. EN standards, relevant legislation, technical rules of other Member States of the European Union) to be able to assess the operational safety of the relevant systems and equipment.’. Navigation lights, their casings and accessories shall bear the approval mark prescribed by Council Directive 96/98/EC of 20 December 1996 on marine equipment (1). Radar navigation equipment and rate-of-turn indicators shall fulfil the requirements laid down in Annex IX Part I and Part II. Compliance with these requirements shall be determined by a type-approval issued by the competent authority. Inland Electronic Chart Display Information System (hereinafter referred to as “ECDIS”) equipment which can be operated in navigation mode shall be regarded as radar navigation equipment. The requirements concerning installation and operational testing of radar navigation systems and rate-of-turn indicators used in inland waterway vessels, laid down in Annex IX, Part III shall be met. regularly, at least every five years. The inspection shall involve an internal and an external inspection. Compressed-air vessels the interior of which cannot be properly inspected, or the condition of which cannot be clearly established during the internal inspection, are required to undergo additional non-destructive testing or a hydraulic pressure test. An inspection certificate shall be issued, signed by the expert and showing the date of the inspection. stand-alone back-up lights for the prescribed mooring lights. For the portable fire extinguishers required by paragraph 1, only powder type extinguishers with a content of at least 6 kg or other portable extinguishers with the same extinguishing capacity may be used. They shall be suitable for Class A, B, C fires. By way of derogation on vessels with no liquefied gas installations, spray foam fire extinguishers using aqueous film-forming foam (AFFF-AR)frost proof to minus (–) 20 °C are permissible even if they are unsuitable for Class C fires. These fire extinguishers shall have a minimum capacity of 9 litres. Portable fire extinguishers shall be checked at least every two years by a competent person. An inspection label shall be affixed to the fire extinguisher, signed by the competent person and showing the date of the inspection.’. regularly, at least every two years. Inspections as referred to in point (d) may also be carried out by a competent person from a competent firm specialising in fire extinguishing systems. When carrying out the check in accordance with paragraph 6, the expert or competent person shall verify whether the systems meet the requirements of this paragraph. functional testing of the pressure tanks and pumping system. Inspections as referred to in point (dd) may also be carried out by a competent person from a competent firm specialising in fire extinguishing systems. signs in accordance with Appendix I, Figure 10, at least 15 cm in diameter, shall be affixed in clearly visible positions at the point where the side deck begins. signs in accordance with Appendix I, Figure 10, at least 15 cm in diameter, have been affixed in clearly visible positions on deck. Paragraphs 4, 4a and 4b are temporary requirements according to Article 1.06 and will be valid until 1 December 2016.’. Paragraph 2 is a temporary requirement according to Article 1.06 and will be valid until 1 December 2016.’. regularly, at least every 10 years. In this inspection proof of adequate strength and stability shall be provided by calculations and an on-board load test. Where a crane’s safe working load does not exceed 2 000 kg the expert may decide that the proof by calculation may be fully or partly replaced by a test with a load 1,25 times the safe working load carried out over the full working range. Cranes shall be checked regularly and in any case at least every 12 months, by a competent person. During that inspection the safe working condition of the crane shall be determined by a visual check and an operating check. on every renewal of the attestation referred to in Article 14.15.
distance of the centre of gravity of the lateral plane AW from the plane of draught according to the considered loading condition in [m]. For one-compartment status the bulkheads can be assumed to be intact if the distance between two adjacent bulkheads is greater than the damage length. Longitudinal bulkheads at a distance of less than B/3 to the hull, measured perpendicular to the centre line from the shell plating at the maximum draft shall not be taken into account for calculation purposes. A bulkhead recess in a transverse bulkhead that is longer than 2,50 m, is considered a longitudinal bulkhead.’. be so arranged, that sight lines in accordance with Article 7.02 do not pass through them. Superstructures or their roofs consisting completely of panoramic panes and enclosures created by awnings or similar mobile installations and their substructures shall be so designed as to, and shall only be manufactured from materials which, in the event of an accident, reduce as much as possible the risks of injury to the persons on board.’. Awnings and similar mobile installations with which deck areas are fully or partially enclosed and their substructures shall be at least flame-retardant.’. Paragraphs 2 to 10 shall apply to craft that are longer than 110 m, with the exception of passenger vessels. The basic values for the stability calculation, the vessel’s lightweight and the location of the centre of gravity shall be determined by means of an inclining experiment carried out in accordance with Annex I to IMO Resolution MSC 267 (85). The applicant shall prove, by means of a calculation based on the method of lost buoyancy, that the buoyancy and stability of the vessel are appropriate in the event of flooding. All calculations shall be carried out with free sinkage and trim. Sufficient buoyancy and stability of the vessel in the event of flooding shall be proven with a cargo corresponding to its maximum draught and evenly distributed among all the holds and with maximum supplies and fully fuelled. For diversified cargo, the stability calculation shall be performed for the most unfavourable loading condition. This stability calculation shall be carried on board. For this purpose, mathematical proof of sufficient stability shall be determined for the intermediate stages of flooding (25 %, 50 % and 75 % of flood build up, and, where appropriate, for the stage immediately prior to transverse equilibrium) and for the final stage of flooding, in the loading conditions specified above. from the bottom upwards without limit. from the base 0,39 m upwards, the sump excepted. Any bulkheads within the damaged area shall be assumed damaged, which means that the subdivision shall be chosen so that the vessel remains afloat after the flooding of two or more adjacent compartments in the longitudinal direction. For the main engine room only the one compartment standard need be taken into account, i.e. the end bulkheads of the engine room shall be assumed as not damaged. For bottom damage, adjacent athwart ship compartments shall also be assumed as flooded. Permeability shall be assumed to be 95 %. If a calculation proves that the average permeability of a compartment is less than 95 %, the calculated value may be used instead. double bottoms, fuel tanks, ballast tanks, etc. depending on whether, according to their function, they have to be assumed as full or empty for the vessel floating at the maximum permissible draught: 0 or 95 %. The calculation of free surface effect in intermediate stages of flooding shall be based on the gross surface area of the damaged compartments. non-watertight openings shall not be immersed before the heel in the equilibrium position of the intermediate stage in question has been reached. 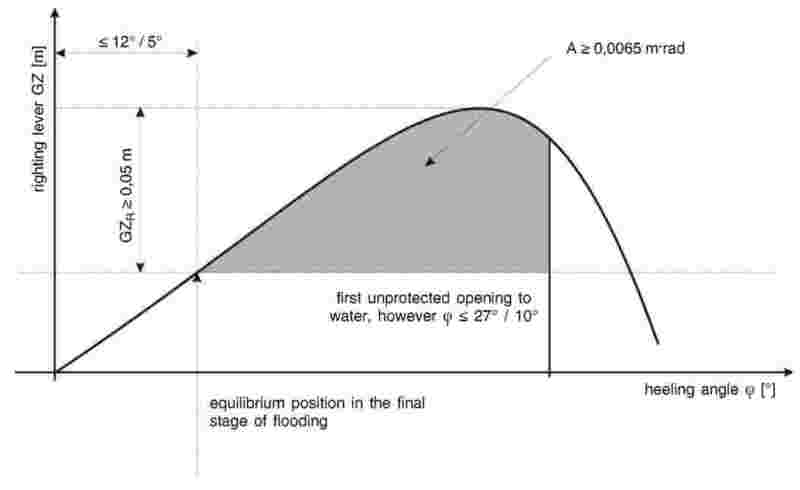 if non-watertight openings are immersed before the equilibrium position is reached, the rooms affording access shall be deemed flooded for the purposes of the damaged stability calculation. the total time allowed for equalisation shall not exceed 15 minutes. The proof by calculation in accordance with paragraphs 3 to 7 shall be considered to have been provided if damaged stability calculations in accordance with Part 9 of the Regulations annexed to the European Agreement concerning the International Carriage of Dangerous Goods by Inland Waterways (hereinafter referred to as “AND”) are produced with a positive result. Radar navigation equipment which has received an approval before 1.1.1990 may be installed and used until issue or renewal of the Community certificate after 31.12.2009, in any case at the latest until 31.12.2011, if there is a valid installation certificate pursuant to this Directive or Resolution CCNR 1989-II-35. Rate-of-turn indicators, which have received an approval before 1.1.1990 and have been installed before 1.1.2000, may be installed and used until issue or renewal of the Community certificate after 1.1.2015, if there is a valid installation certificate pursuant to this Directive or Resolution CCNR 1989-II-35. Receptacles made of steel or another sturdy, non-flammable material and holding at least 10 l.
Passenger area’s under the bulkhead deck behind the collision bulkhead and in front of the aft peak bulkhead. Navigation lights, their casings, accessories, and light sources that fulfil the requirements for colour and light intensity of navigation lights and for the admission of signal lights for navigation on the Rhine as of 30 November 2009 may still be used. Radar navigation equipment and rate-of-turn indicators which have received an approval after 1.1.1990 pursuant the minimum requirements and test conditions for radar installations used for navigation in inland waterway navigation on the Rhine and the minimum requirements and test conditions for rate-of-turn indicators used in inland waterway navigation on the Rhine may continue to be installed and operated if a valid installation certificate pursuant to this Directive or Resolution CCNR 1989-II-35 has been issued. NRC, at the latest on issue or renewal of the Community certificate after 1.1.2015. Passenger areas under the bulkhead deck and in front of the aft peak bulkhead. Requirements for enclosures within the superstructure that consist totally or partly of panoramic windows. Radar navigation systems and rate-of-turn indicators, which have been approved and installed pursuant to a Member State’s regulations before 31 December 2012 may continue to be installed and operated until the issue or replacement of the Community certificate after 31 December 2018. These systems must be entered in the Community certificate under number 52. Where parts of different vessels are joined together, status quo protection shall be granted only for the parts which belong to the vessel which retains its Community certificate. Transitional provisions may therefore be invoked only for those parts. Other parts shall be treated as a newly built vessel. Where parts of different vessels are joined together, transitional provisions may be invoked only for those parts which belong to the vessel which retains its Community certificate. Parts which do not belong to the vessel which retains its vessel certificate shall be treated as a newly built craft. After a vessel has had part of another vessel added to it, the former shall receive the European vessel identification number of the craft, which retains its Community certificate as the converted craft. Where an existing Community certificate is retained or a new Community certificate is issued for a craft after a conversion, the year of construction of the oldest part of the craft shall additionally be entered in the Community certificate. If a new fore section is attached to a craft, the engine for the bow thruster system installed in the fore section shall also comply with the current requirements. If a new stern section is attached to a vessel, the engines installed in the stern section shall also comply with the current requirements. A vessel is put together from two older vessels (vessel 1 year of construction 1968; vessel 2 year of construction 1972). The whole of vessel 1 apart from the fore section is used; of vessel 2, the fore section is used. The assembled vessel receives vessel 1’s Community certificate. The fore section of the assembled vessel must now be fitted, inter alia, with anchor niches. A vessel is put together from two older vessels (vessel 1 year of construction 1975; vessel 2 year of construction 1958, oldest component 1952). The whole of vessel 1 apart from the fore section is used; of vessel 2, the fore section is used. The assembled vessel receives vessel 1’s Community certificate. The fore section of the assembled vessel must now be fitted, inter alia, with anchor niches. The oldest component from the original vessel 2, with year of construction 1952, is additionally entered in the Community certificate. The stern section of a vessel of year of construction 2001 is attached to a vessel of year of construction 1988. The engine of the vessel of year of construction 1988 is to remain in the vessel. In this case, the engine has to be type approved. The engine would also have to be type approved if it was the engine in the 2001 stern section. In any decision on the application of transitional provisions in the case of change of the type of craft (vessel type; intended use of the vessel), as regards to Annex II to this Directive safety considerations shall be key. It shall constitute a change in the type of craft if the safety requirements applying to the new type of craft are different from those for the old type; this is so if special provisions of Chapters 15 to 22b of Annex II are applicable to the new type which were not applicable to the old type. In the case of a change in the type of craft, all special provisions and all requirements specific to this type of craft shall be complied with fully; transitional provisions may not be invoked for these requirements. This also applies to parts which are taken over from the existing craft and come under these special requirements. The conversion of a tanker into a dry cargo vessel shall not constitute a change in the type of craft as defined in 2.1.2. In the case of conversion of a cabin vessel into a day-trip vessel, all new parts shall comply fully with the current requirements. Article 24.02(2) (NRC), resp. Article 24a.02(2) applies to the parts of the craft that are renewed; hence new parts of the craft cannot be subject to the transitional provisions. For the parts of the craft that are not converted, the transitional provisions shall continue to be applicable with the exception of parts according to 2.1.3, second sentence. If the dimensions of the craft are modified, the transitional provisions no longer apply to those parts of the craft that are connected with this modification (e.g. distance of collision bulkhead, freeboard and anchor). In the case of a change in the type of craft, the special requirements of Annex II that only apply to the new type of craft shall be applicable. All parts and items of equipment that are affected by the conversion of the craft must satisfy the current requirements Part II and III of Annex II. The craft shall then be granted a new or amended Community certificate and a note shall be made in fields 7 and 8 of the certificate both of the original construction and of the conversion. A cargo vessel (year of construction 1996) is converted into a passenger vessel. Chapter 15 of Annex II then applies to the whole vessel, without invoking transitional provisions. If the fore section is not modified either according to the conversion plans or in accordance with Chapter 15, the vessel does not need to present any anchor niches in accordance with Article 3.03. A tug (year of construction 1970) is converted into a pusher. The physical conversion consists solely of changing the deck equipment and installing a pushing device. All transitional provisions for a 1970 vessel remain applicable, except for the Chapters 5, 7 (in part), Article 10.01 and Article 16.01. A motor tanker (year of construction 1970) is converted into a pusher. The physical conversion consists of separating off the fore section and the cargo section, as well as changing the deck equipment and installing a pushing device. All transitional provisions for a 1970 vessel remain applicable, except for the provisions of Chapters 5, 7 (in part), Article 10.01 and Article 16.01. A motor tanker is converted into a motor cargo vessel. The motor cargo vessel must comply with current workplace safety requirements, particularly those referred to in Article 11.04 of Chapter 11 of Annex II. Conversion measures that are necessary in order to comply with requirements of Chapter 15, no matter when they are carried out, shall not constitute conversion “C” within the meaning of Article 24.02(2), Article 24.03(1) or Article 24.06(5) of Annex II, resp. Article 24a.02, Article 24a.03. A passenger vessel (year of construction 1995) must have a second independent propulsion system installed by 1 January 2015 at the latest. If no other voluntary conversions are made on this passenger vessel, it is not necessary to carry out a stability calculation in accordance with the new requirements, but if there is an objective need for one, a stability calculation may be carried out in accordance with the original stability requirements of a Member State. A passenger vessel (year of construction 1994, vessel certificate last renewed 2012) will be extended by 10 m in 2016. In addition, this craft must be given a second independent propulsion system. Also, a new stability calculation will be necessary, which must be carried out in accordance with Chapter 15 for the one-compartment status and the two-compartment status. Under Article 15.02 paragraph 5 it is conceivable that local watertight subdivisions, such as transversally subdivided double bottom tanks of a greater length than the damage length to be considered, will not be included in the evaluation. In this case it might not be possible to take the transversal subdivision into account if it is not extended up to the bulkhead deck. This might lead to inappropriate subdivisions of bulkheads. If a watertight compartment is longer than required by Article 15.03 paragraph 9 and it contains local subdivisions which form watertight sub compartments, and between which the minimum damage length can be contained, these can be taken into account in the damaged stability calculation. Enclosures made with awnings or similar mobile installations can cause problems with the stability of the vessel since, if of sufficient size to do so, they influence the heeling moment due to wind pressure. Special anchors with a reduced mass, authorised by competent authorities according to Article 10.01 paragraph 5 are listed in the following table. 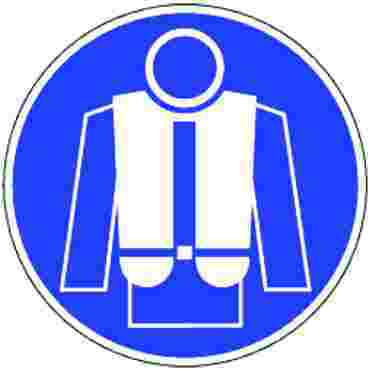 In respect of vessels allowed to navigate on the Rhine, i.e. In the case of engine rooms and boiler rooms these checks shall be made under various machine operation conditions and under changing ventilation conditions. Inspections as referred to in subsection (c) above may also be carried out by a competent person from a competent firm specialising in fire extinguishing systems. Checks as referred to in subsection (c) above may also be carried out by a competent person trained in safety guidance systems. An inspection certificate shall be issued, signed by the expert or competent person and showing the date of the inspection. A calibration and inspection certificate shall be issued, signed by the expert or competent person and showing the date of the inspection. officially approved persons or institutions with recognised expertise for the scope of inspection in the relevant subject area, whereby the vessel inspection bodies can also issue this approval in their capacity as public agencies, ideally on the basis of a quality assurance system. A person or institution is also deemed to be approved if the latter has passed an official selection procedure which specifically assesses the possession of the required expertise and experience. manufacturers of special-purpose systems (e.g. fire extinguishing systems, control equipment). The table below summarises the schedule of acceptance tests, including their frequency and the type of inspector required to conduct them. This table is for information purposes only. Recreational craft of up to 24 metres length, that are placed on the market, have to comply with the requirements of Directive 94/25/EC of the European Parliament and of the Council (14), as amended by Directive 2003/44/EC (15). According to Article 3 in conjunction with Article 2 of this Directive, recreational craft having a length of 20 metres or more shall carry a Community inland navigation certificate attesting the craft’s compliance with the technical requirements of Annex II. Since double inspection or certification for certain equipment, arrangements and installations of newly built recreational craft which can result from certain provisions in Article 21.02 of Annex II should be avoided, this Administrative Instruction gives information on those requirements listed in Article 21.02 that are already sufficiently covered under Directive 94/25/EC. (2) Partitions between control centres and internal muster areas shall correspond to Type A0, but external muster areas only to Type B15. (3) Partitions between lounges and internal muster areas shall correspond to Type A30, but external muster areas only to Type B15. (4) Partitions between cabins, partitions between cabins and corridors and vertical partitions separating lounges according to paragraph 10 shall comply with Type B15, for rooms fitted with pressurised sprinkler systems B0. Partitions between cabins and saunas shall comply with Type A0, for rooms fitted with pressurised sprinkler systems B15. (5) Partitions between engine rooms according to Articles 15.07 and 15.10(6) shall comply with Type A60; in other cases they shall comply with Type A0. (6) Partitions between store rooms for the storage of flammable liquids and control centres and muster areas shall comply with Type A60, for rooms fitted with pressurised sprinkler systems A30. (7) B15 is sufficient for partitions between galleys, on the one hand, and cold-storage rooms and food store rooms, on the other. (8) Partitions between control centres and internal muster areas shall correspond to Type A0, but external muster areas only to Type B15. (9) Partitions between lounges and internal muster areas shall correspond to Type A30, but external muster areas only to Type B15. (10) Partitions between cabins, partitions between cabins and corridors and vertical partitions separating lounges according to paragraph 10 shall comply with Type B15, for rooms fitted with pressurised sprinkler systems B0. Partitions between cabins and saunas shall comply with Type A0, for rooms fitted with pressurised sprinkler systems B15. (11) Partitions between engine rooms according to Articles 15.07 and 15.10(6) shall comply with Type A60; in other cases they shall comply with Type A0. (12) Partitions between store rooms for the storage of flammable liquids and control centres and muster areas shall comply with Type A60, for rooms fitted with pressurised sprinkler systems A30. (14) OJ L 164, 30.6.1994, p. 15. (15) OJ L 214, 26.8.2003, p. 18.’. Until their approval under Parts I and II, classification societies which are recognised and approved and authorised by a Member State in accordance with Council Directive 94/57/EC of 22 November 1994 on common rules and standards for ship inspection and survey organisations and for the relevant activities of maritime administrations (1) are currently approved in accordance with Article 10 of this Directive only in respect of vessels which operate exclusively on waterways of that Member State. (1) OJ L 319, 12.12.1994, p. 20’. “Type approval” means the administrative procedure by which a Member State confirms that equipment complies with the requirements of this Annex. “Competent authority” means the official authority that issues the type approval. These provisions set out the minimum requirements for radar equipment used for navigation on board inland waterway vessels as well as the conditions for testing conformity with these minimum requirements. The radar navigation equipment shall facilitate the navigation of the vessel by providing an intelligible radar picture of its position in relation to buoys shorelines and navigational structures, as well as permitting the reliable and timely recognition of other vessels and obstructions protruding above the water surface. With the exception of requirements on electromagnetic compatibility (Article 3.1.b of Directive 1999/5/EC) and of requirements on the effective use of the spectrum so as to avoid harmful interference arising from Article 3.2 of Directive 1999/5/EC, radar navigation equipment used in inland waterway vessels shall fulfil the requirements of European standard EN 302194-1: 2006. Paragraph 1 applies to inland ECDIS equipment which can be operated in navigation mode. This equipment shall additionally fulfil the requirements of the Inland ECDIS standards in the version valid on the date of issue of the type approval. Compliance with the minimum requirements as specified in Article 3(1) shall be established by means of a type test. If the equipment passes the type test the testing establishment shall issue a test certificate. If the equipment fails to meet the minimum requirements, the applicant shall be notified in writing of the reasons for its rejection. Applications for a type test of a radar navigation installation shall be submitted to a technical service. The technical services shall be notified to the European Commission. where applicable, evidence of previously completed tests. In case it is not intended by the applicant to have the Declaration of Conformity pursuant to Directive 1999/5/EC established concurrently with the type-approval, a Declaration of Conformity shall be submitted together with the application for a type test. Type-approval shall be granted by the competent authority pursuant to the test certificate. The competent authority shall inform the European Commission of the equipment for which it has issued type approval. The relevant notice shall include the type-approval number assigned, as well as the type designation, the name of the manufacturer, the name of the holder of the type-approval and the date of the type approval. Each competent authority or the technical service designated by the competent authority shall be entitled to select equipment from the production series at any time for inspection. If this inspection reveals defects in the equipment, type-approval may be withdrawn. The type-approval shall be withdrawn by the authority that issued it. The type-approval number assigned by the competent authority shall be affixed indelibly to the display unit in such a way that it remains clearly visible after the equipment has been installed. three-digit number, to be determined by the competent authority. The type-approval number shall be used only in conjunction with the associated type-approval. It shall be the responsibility of the applicant to produce and affix the type-approval number. Each unit of equipment shall be accompanied by a manufacturer’s declaration. Any modification made to equipment already approved shall cause the type-approval to be withdrawn. Whenever modifications are planned, details shall be sent in writing to the competent technical service. The competent authority shall decide following consultation with the technical service whether the type-approval still applies or whether an inspection or new type test is necessary. If a new type test is granted, a new type-approval number shall be assigned. These provisions set out the minimum requirements for rate-of-turn indicators used on board inland waterway vessels, as well as the conditions for testing conformity with these minimum requirements. The rate-of-turn indicator is intended to facilitate radar navigation, and to measure and indicate the rate of turn of the vessel to port or starboard. Compliance with the minimum requirements for rate-of-turn indicators pursuant to Chapters 2 to 4 shall be established by means of a type test. If the equipment passes the type test the technical service shall issue a test certificate. If the equipment fails to meet the minimum requirements, the applicant shall be notified in writing of the reasons for its rejection. Applications for a type test of a rate-of-turn indicator shall be submitted to a technical service. By means of tests, the applicant shall establish or have it established that the equipment meets the minimum requirements of these provisions. The results of the test and the measurement reports shall be attached to the application. These documents and the information obtained during testing shall be kept by the competent authority. Type approval shall be granted by the competent authority pursuant to the test certificate. The competent authority shall inform the European Commission of the equipment it has approved. The relevant notice shall include the type approval number assigned, as well as the type designation, the name of the manufacturer, the name of the holder of the type approval and the date of the type approval. If this inspection reveals defects in the equipment, type approval may be withdrawn. The type-approval number assigned by the competent authority shall be affixed indelibly to the control unit in such a way that it remains clearly visible after the equipment has been installed. Any modification made to equipment already approved shall cause the type-approval to be withdrawn. Whenever modifications are planned, details shall be sent in writing to the competent technical service. If a new type test is granted, a new type approval number shall be assigned. Rate-of-turn indicators shall be suitable for operation on board inland waterway vessels. The construction and design of the equipment shall be in accordance with current good engineering practice, both mechanically and electrically. In the absence of any specific provision in Annex II or in this Annex, the requirements and test methods contained in European Standard EN 60945:2002 shall apply to power supply, safety, mutual interference of ship borne equipment, compass safe distance, resistance to climatic influences, mechanical strength, environmental influences, audible noise emission and equipment markings. Additionally, the equipment shall satisfy all requirements of this Annex at ambient temperatures between 0 and 40 °C. Rate-of-turn indicators shall meet the requirements of Directive 2004/108/EC (2) of the European Parliament and of the Council of 15 December 2004 on the approximation of the laws of the Member States relating to electromagnetic compatibility and repealing Directive 89/336/EEC. In the frequency ranges of 156 to 165 MHz, 450 to 470 MHz and 1,53 to 1,544 GHz the field strength shall not exceed a value of 15 μV/m. These field strengths shall apply at a test distance of 3 metres from the equipment under test. The equipment shall not have more controls than are necessary for its correct operation. The design, markings and manipulation of the controls shall be such as to permit their simple, unambiguous and fast operation. Their arrangement shall be such as to prevent operational mistakes as far as possible. Controls that are not necessary for normal operation shall not be immediately accessible. All controls and indicators shall be provided with symbols or markings in English. Symbols shall meet the requirements of European Standard EN 60417:1998. All numerals and letters shall be at least 4 mm high. If it can be demonstrated that, for technical reasons, numerals and letters 4 mm high are not possible and if for the purposes of operation smaller numerals and letters are acceptable, a reduction to 3 mm shall be allowed. The equipment shall be designed in such a way that operating mistakes cannot cause its failure. Any functions over and above the minimum requirements, such as facilities for connection to other equipment, shall be provided in such a way that the equipment meets the minimum requirements under all conditions. The direction of installation in relation to the keel line shall be indicated on the rate-of-turn indicator’s sensor unit. Installation instructions shall be provided to ensure maximum insensitivity to other normal movements of the vessel. From a cold start, the rate-of-turn indicator shall be fully operational within 4 minutes and shall operate to within the required accuracy tolerances. A warning signal shall indicate that the indicator is switched on. It shall be possible to observe and operate the rate-of-turn indicator simultaneously. Cordless remote controls shall not be permitted. The rate of turn shall be indicated on a linear graduated scale having the zero point situated in the middle. It shall be possible to read the direction and extent of the rate of turn with the necessary accuracy. Indicators other than needle indicators and bar-graphs shall not be permitted. The indicator scale shall be at least 20 cm long and may be circular or rectilinear. Rectilinear scales may be arranged horizontally only. Solely digital indicators shall not be permitted. 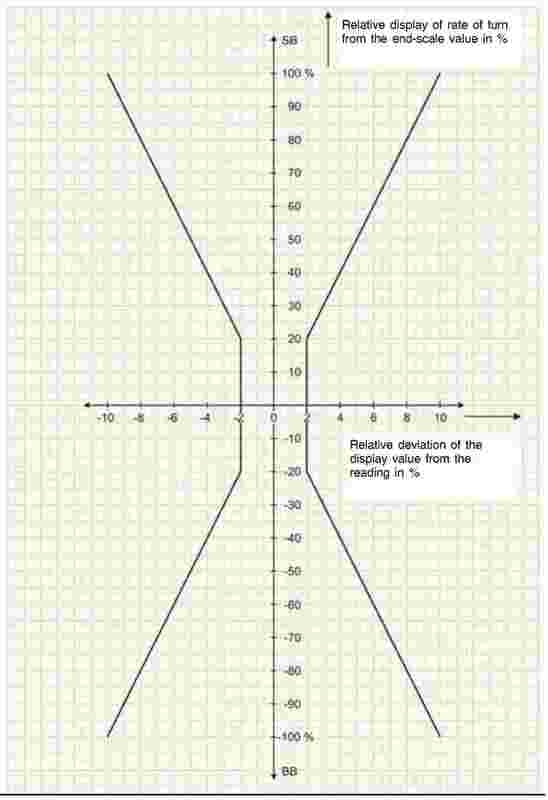 The indicated rate of turn shall not differ by more than 2 % from the measurable maximum value or by more than 10 % from the actual value; whichever is the greater (see Appendix). The operating threshold shall be less than or equal to a change in angular speed equivalent to 1 % of the indicated value. If the rate-of-turn indicator does not operate within the required accuracy range, this shall be indicated. If a gyroscope is used, any critical fall in the rate of rotation of the gyroscope shall be signalled by an indicator. A critical fall in the rate of rotation of the gyroscope is one which lowers accuracy by 10 %. Rolling of the vessel of up to 10° at a rate of turn of up to 4°/s shall not give rise to measurement errors in excess of the stipulated tolerances. Impacts such as those that may occur during berthing shall not give rise to measurement errors in excess of the stipulated tolerances. The rate-of-turn indicator shall be insensitive to magnetic fields which typically occur on board the vessel. Slave indicators shall comply with all requirements applicable to rate-of-turn indicators. All controls shall be so arranged that during their operation no information is concealed from view and radar navigation remains unimpaired. All controls and indicators shall be provided with a dazzle-free source of lighting appropriate for all ambient lighting conditions and adjustable down to zero by means of an independent control. Adjustment of controls shall be such that movements to the right or upwards have a positive effect on the variable and movements to the left or downwards a negative effect. If push-buttons are used, it shall be possible to locate and operate them by touch. They shall also have clearly perceptible contact release. If pushbuttons have multiple functions, it must be apparent which hierarchical level is active. The sensor system shall be damped for critical values. The damping constant (63 % of the limit value) shall not exceed 0,4 s.
The indicator shall be damped for critical values. Controls for increasing damping shall be permitted. Under no circumstances may the damping constant exceed 5 s.
If the rate-of-turn indicator can be connected to slave indicators or similar equipment, the rate-of-turn indication shall remain usable as an analogue electric signal. In addition, the rate-of-turn indicator may possess a digital interface in accordance with (2). The rate of turn shall continue to be indicated with galvanic earth insulation and the equivalent to an analogue voltage of 20 mV/°/min ± 5 % and a maximum internal resistance of 100 Ω.
Polarity shall be positive when the vessel is turning to starboard and negative when it is turning to port. The operating threshold shall not exceed 0,3°/min. Zero error shall not exceed 1°/min at temperatures from 0 to 40 °C. With the indicator switched on and the sensor not exposed to the effects of movement, the spurious voltage at the output signal measured with a 10 Hz pass-band low-pass filter shall not exceed 10 mV. The rate-of-turn signal shall be received without additional damping beyond the limits referred to in Article 4.02 (1). A digital interface shall be designed pursuant to European standards EN 61162-1: 2008, EN 61162-2: 1998 and EN 61162-3: 2008. An external alarm switch shall be provided. The switch shall be installed as a galvanic insulation break-switch for the indicator. if the operating control has reacted following an excessive error (Article 3.06). Power supply, safety, mutual interference of ship borne equipment, compass safe distance, resistance to climatic influences, mechanical strength, environmental impact, audible noise emission and electromagnetic compatibility shall be tested in accordance with European Standard EN 60945:2002. Spurious emissions shall be measured in accordance with European Standard EN 60945:2002 in the frequency range of 30 to 2000 MHz. The requirements of Article 2.02 (2) shall be met. Rate-of-turn indicators shall be tested under nominal and boundary conditions. In this regard, the influence of the operating voltage and of the ambient temperature shall be tested as far as the prescribed limit value. In addition, radio transmitters shall be used to set up the maximum magnetic fields in the vicinity of the indicators. Under the conditions described in paragraph 1, indicator errors shall remain within the tolerances indicated in the Annex. All minimum requirements of Chapters 2 to 4 shall be met. Installation and performance tests of radar navigation equipment and rate-of-turn indicator systems must take place according to the following provisions. shall be authorised for installation. The installation, replacement, repair or maintenance of radar navigation equipment and rate-of-turn indicators shall be carried out only by specialised firms approved by the competent authority. The competent authorities responsible for approval shall be notified to the European Commission. Approval may be withdrawn by the competent authority. The competent authority shall immediately notify the European Commission of the specialised firms which it has approved. All power supply leads for radar navigation equipment and rate-of-turn indicators shall have their own separate safety devices and if possible be fail-safe. The radar antenna shall be installed as close as possible to the fore-and-aft-line. There shall be no obstruction in the vicinity of the antenna causing false echoes or unwanted shadows; if necessary, the antenna shall be mounted on the forecastle. The mounting and attachment of the radar antenna in its operational position shall be sufficiently stable to enable the radar navigation equipment to perform within the required accuracy limits. After the angular error in the mounting has been corrected and the equipment has been switched on, the difference between lubber line and fore-and-aft-line shall not be greater than 1°. The display unit and control unit shall be installed in the wheelhouse in such a way that the evaluation of the radar image and the operation of the radar navigation equipment present no difficulty. The azimuthal orientation of the radar image shall be in accordance with the normal situation of the surroundings. Holders and adjustable consoles shall be constructed in a way that they can be fixed in each position free of vibration. During radar navigation, artificial lighting shall not be reflected in the direction of the radar operator. When the control unit is not part of the display unit, it shall be located in housing within 1 metre of the display unit. Cordless remote controls shall not be permitted. If slave indicators are installed, they shall satisfy the requirements which apply to navigational radar equipment. The rate-of-turn indicator shall be located ahead of the helmsman and within their field of vision. The sensor system shall be installed as far as possible amidships, horizontal and aligned with the ship’s fore-and aft-line. The installation site shall as far as possible be free of vibration and be liable only to modest temperature variations. The indicator unit shall if possible be installed directly above the radar display. If slave indicators are installed, they shall satisfy the requirements which apply to rate-of-turn indicators. For inland ECDIS equipment which is operated in navigation mode, the position sensor (e.g. DGPS antenna) must be installed in such a way as to ensure that it operates with the greatest possible degree of accuracy and is not adversely affected by superstructures and transmitting equipment on board ship. the radar navigation equipment or rate-of-turn indicator shall not interfere with other on-board equipment. After successful completion of a test in accordance with Article 8, the competent authority, the technical service or the approved firm shall issue a certificate based on the model according to Part IV. This certificate shall be kept permanently on board. If the test conditions have not been met, a list of defects shall be drawn up. Any existing certificate shall be withdrawn or sent to the competent authority by the technical service or the approved firm. It is hereby certified that the radar navigation equipment and rate-of-turn indicators of this vessel meet the requirements of Directive 2006/87/EC Annex IX Part III concerning installation and performance tests of radar navigation systems and rate-of-turn indicators used on board inland waterway vessels. If no authority is given no competent authority was specified by the relevant country. If no approved firm is specified, no approval is granted for firms in this country. (2) OJ L 390, 31.12.2004, p. 24. (3) Cross out what is not applicable. (4) Requirements for the installation and functioning of radar navigation equipment and rate of turn indicators for the navigation on the Rhine.